Peter A. Baci, vice president, Car- ibbean Services. Mr. Baci stated that the service would operate on a fixed-day schedule for vessel arriv- als and departures with sailings every Thursday from Jacksonville and every Friday from Port Ever- glades. Miami to Curacao of three days. Tuesday mornings. The inaugural sailing departed Jacksonville on Feb- ruary 6. Mr. Baci also announced the ap- pointment ofV an Ommeren-Maduro as Crowley's agent in Curacao. "We are pleased to announce the appoint- ment of this long-established com- pany in connection with Crowley's new service to Curacao," Mr.Baci said. Carrier Transicold's new screw chiller package is up to 35% smaller than conventional /stems—without sacrificing cooling capacity. It also ensures quiet, low-vibration operation. Available in capacities from 75 to 1,000 tons, Carrier's full line features .-22 refrigerant, standard. Each model is convertible to R-134a or other zone-friendly blends of the future. And includes advanced microprocessor- ased temperature control with remote monitoring capability, standard. All Carrier Transicold marine systems are backed by expert technical ssistance and warranty protection, as well as parts and service support, in very major port worldwide. So next time, specify Carrier Transicold. And see what a big difference small chiller can make. 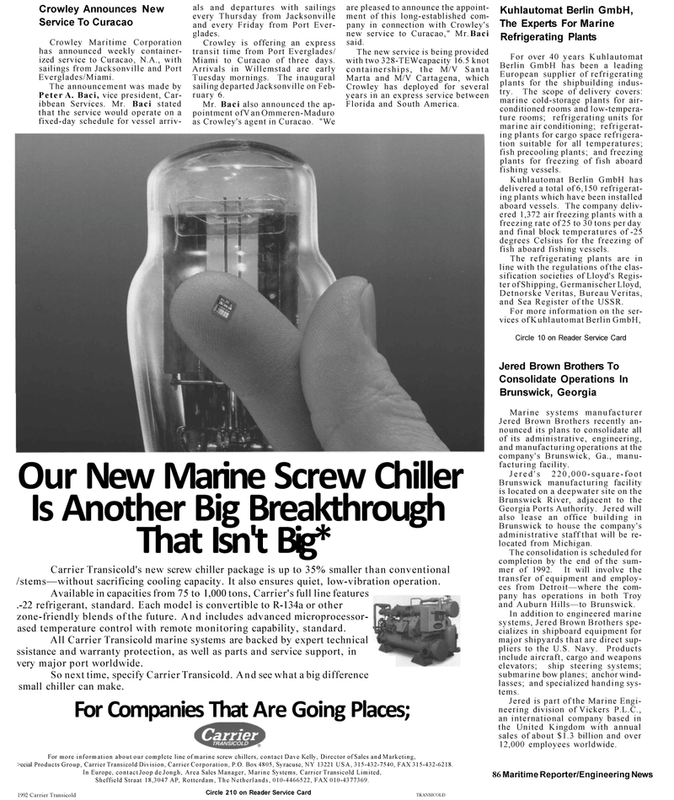 For more information about our complete line of marine screw chillers, contact Dave Kelly, Director of Sales and Marketing, >ecial Products Group, Carrier Transicold Division, Carrier Corporation, P.O. Box 4805, Syracuse, NY 13221 USA, 315-432-7540, FAX 315-432-6218. Sheffield Straat 18,3047 AP, Rotterdam, The Netherlands, 010-4466522, FAX 010-4377369. European supplier of refrigerating plants for the shipbuilding indus- try. The scope of delivery covers: marine cold-storage plants for air- conditioned rooms and low-tempera- ture rooms; refrigerating units for marine air conditioning; refrigerat- ing plants for cargo space refrigera- tion suitable for all temperatures; fish precooling plants; and freezing plants for freezing of fish aboard fishing vessels. Kuhlautomat Berlin GmbH has delivered a total of 6,150 refrigerat- ing plants which have been installed aboard vessels. The company deliv- ered 1,372 air freezing plants with a freezing rate of 25 to 30 tons per day and final block temperatures of -25 degrees Celsius for the freezing of fish aboard fishing vessels. Detnorske Veritas, Bureau Veritas, and Sea Register of the USSR. Jered Brown Brothers recently an- nounced its plans to consolidate all of its administrative, engineering, and manufacturing operations at the company's Brunswick, Ga., manu- facturing facility. Brunswick to house the company's administrative staff that will be re- located from Michigan. The consolidation is scheduled for completion by the end of the sum- mer of 1992. It will involve the transfer of equipment and employ- ees from Detroit—where the com- pany has operations in both Troy and Auburn Hills—to Brunswick. In addition to engineered marine systems, Jered Brown Brothers spe- cializes in shipboard equipment for major shipyards that are direct sup- pliers to the U.S. Navy. Products include aircraft, cargo and weapons elevators; ship steering systems; submarine bow planes; anchor wind- lasses; and specialized handing sys- tems.